what are you viewing this page with? My fave browser. It is highly unstable and takes forever to load but I love it. Even though the new junk they have added to make things easier is just distracting...it is a very user friendly browser. IE is better at handeling Java and other multimedia add-ons (at least on my computer) but I just can't stand IE for some reason. Download your free Netscape Navigator now! They'll throw in tons of free junk in it like Netscape Composer, a truly ghastly webpage editor. Well maybe ghastly isn't the right word... It's an ok editor if you are absolutely lazy and love messy coding. One of the few things about it I like: It'll rainbow colorize text for you! It also has a nifty AOL Instant Messeger Buddy thing. It will allow you to Instant Message (kind of like e-mail but almost in real time) any AOL user when they are online. You can use the AOL Buddy even if you don't have AOL. Just have to sign up for it. Links to some things you might want to have. How can I view .zip files? Wonderful program. Download a shareware version of Paint Shop Pro, free for 30 days. It is worth it. This program will let you do neat things with images and text. 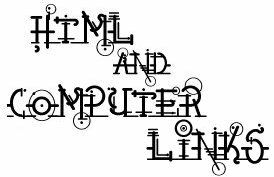 The "Html and Computer Links" banner above and the html code divider was made using Paint Shop Pro. Just about every image here I played with in Paint Shop Pro. This program can do neat things with text. I had the shareware version for a little over a year when I broke down and bought Paint Shop Pro 5. It has a gif animator! It'll give you the pixels of a pic so you can make image maps! Convert images to many different forms like gif, jpg, and bmp. It will also tell you the hex number for the colors, any color you want! I don't have to visit ColorCenter anymore. [What? Hex? Scroll down to the ColorCenter link for a little color lesson.] Paint Shop Pro also lets you "capture" a screen. It will make a pic out of whatever is on your screen. Check out this little pic of my tool bar. Want to make animated gifs (little moving pictures) for your homepage? Download the shareware version here. Try it, like it, pay the shareware fee--$20. Really easy to use. I now use the Paint Shop Pro animator but this one is even easier to use. most ISPs will give you an e-mail account. Don't have one? Don't worry. You can sign-up for free (freeeee!!!) e-mail accounts. You need some kind of e-mail account to get a free webpage from one of the places below. You could sign up for each of these e-mail accounts and for each account sign up for a different webpage at each of the free webpage sites... but that's bad. Very bad. I have an account there, daggair@hotmail.com. You don't need to configure anything...just log-in at their site www.hotmail.com and read your mail. They will let you attatch 1MB of files to the e-mail you send. They also allow you to read mail from your other e-mail accounts. Just fill out all the info (mail server, user name, etc). The makers of my fave browser now gives you free e-mail accounts. I like Netscape. Their browser rules. I've used it for years. I have a disk somewhere containing Netscape Navigator 1.0, yikes! They give you a 5 MB quota. Not bad. Their e-mail setup is quite busy...too many ads. Another search engine, Lycos, will give you free e-mail. Where this site is located (check out the URL dude). Will give you 11MB free space to put up whatever you want. You choose a username and your webpage will be located at "members.tripod.com/~username/". Uploading will definately teach you patience. You can upload 4 things at a time, wow. If you FTP your files it would be faster and easier. Viewing things and editing things can be quite a hassle too. When you upload your pages Tripod will probably tack on a little pop-up ad to your HTML files. It is a free page so you have to put up with it. They are not as irritating as the Geocities add-ons mentioned below. Tripod now requires you to edit your site at least once a month to keep things "fresh". Sheesh! Geocities is probably the largest free webpage provider. They will give you free e-mail if you want too. They give 11MB free. You browse around and look for a neighborhood your page will best fit into. If it is about how you got abducted by aliens last summer, Area 51, a sci-fi neighborhood, would be the place for you. About your fave tv show? Maybe Television City or Hollywood is the place for you. The neighborhoods are arranged in little subdivisions then in blocks so your page's URL could look like "www.geocities.com/Area51/Labyrinth/7817/" (that'll take you to Acme Crimenet, a fanfic site). It can be hard to remember at times. You choose a username, this becomes your e-mail address (username@geocities.com). The file editors and uploaders are good here. Geocities is a really good free webpage provider except...those pop-up ads and that watermark! When you upload HTML files they tack on a pop-up ad and a moving geocities graphic link. The little graphic ends up on the lower right corner of your page. It moves up and down as the visitor scrolls. A little "g" or "geocites". If you click it it will take you to their homepage. I don't know much about this place but I do know that they will keep an eye on you. If they think that you are doing anything remotely illegal they will pull your page. 11 MB free space and a free e-mail account for your trouble. You now need something to use to write that HTML stuff. Try this. This is what I use. It is a basic HTML editor, just a plain little text editor with a few buttons to make some things a little easier. You get to work the actual HTML source. None of this - type it out and I'll write the code for you so you don't have to learn a thing - junk the other editors support. It also does something wonderful...it will let you preview the page without having to save. I like the fact that I can control everything that happens to my HTML source and can easily edit it. MS FrontPage, Netscape Composer, and other editors bug me. They correct your HTML for you even if you don't ask them to. My beautiful tags jumbled around in some incoherant, irrational order...sob. I say if it works, leave it alone! Links to places for budding HTML magicians. Most browsers know the basic colors like white, black, red, green, brown, yellow, blue, orange, purple, and some more exotic sounding shades so you could use the generic <FONT COLOR="blue"> to spice up you webpages but what if the shade of blue they say is blue is not the blue you want? Go find the correct hex number and get what you want, not the color the browsers tell you to use! <BODY BGCOLOR="#000000" TEXT="#FFFFFF" LINK="#008080" VLINK="#CCCCCC" ALINK="#98D9F4"> This'll give ya a black page with white text, green unvisited links, grey visited links, and when the link is clicked on it will briefly turn blue. Throw the number in <TABLE BGCOLOR="#4DE5FB"> to color your tables. Throw it in the <TD> tag to just color one cell. ColorCenter will also let you preview your color combinations. Flurecent green links with blue text on a red background might sound good... but testing before you inflict your color preferences on others is always a good idea. HTML primers for newbies, tutorials on just about everything. Also home of Java Goodies. Has some pretty good basic tutorials. Under construction. Still waiting for some of those advanced classes. The Super Simple Form Tutorial! Where I learned to do forms. What's a form? You type something in to a little box in a webpage, click submit, it then e-mails the info you just gave to the webmaster. This place goes step by step teaching you how to put forms on your homepage. It explains how to do different types of forms, using a language not too difficult to understand. It is a geocities page and shows you how to do it in geocities. For your page you must change the <FORM METHOD="post" ACTION="how your ISP sends you the forms"> tag. Tons of free CGI scripts and other programmer geek goodies. Are you a fontaholic? I kinda am. Recovering fontaholic. I visit font sites only once a month now to look for new fonts. Visit these sites and download the fonts. Some are zipped so you need some kind of unzip program (take a look at my utility links). How do I install the fonts? Click Start-> Settings--> Control Panel--> Fonts--> File--> Install New Font--> find the location of the font--> click ok--> Your computer makes a copy of the font and throws it in C:\Windows\Fonts. FYI...the font for the "html and computer links" banner above is called Snipple while the cute little tag divisor is Soopafresh. This is Microsoft's typography page. They have free fonts and font utilities for you to download. It has font families for you to download in .exe form. Save the file, click on it. It will extract the font and install it for you. Home of wonderful and boring fonts like: Times New Roman, Andale Mono, Courier, Verdana, Comic Sans, Arial, Georgia, and others. I use Verdana and Times New Roman a lot here, sometimes Arial. Without them the pages look funky. Has some pretty nifty free fonts. FREE!!!! For windows (true type) or mac. Fonts like: Electric Hermes, Prick, OrnaMental, Seaweed Fire, and others! A lot of my favorite fonts can be found here. For windows (true type). Home of some of the best fonts found on the net. Lots of kooky, adorable, usefull, unusual fonts you just have to go there and look around for yourself. A true type font archive! Has shareware and freeware fonts for windows. Tons of fonts in neat little categories like: Handwriting, Creepy, Deco, and Cool. Has some of my favorite fonts. For windows (true type) or mac. Home of Trash, Taxidermist, Montezuma's Revenge, and other wonderful fonts. Trash is the font I used for the "until next crime..." logo on the home page. Taxidermist can be seen in the banner for "Skull and Double-Crossbones". 2000+ fonts and other things to make you happy. Has some nice sci-fi fonts categorized by show, series, or game. Babylon 5, Star Trek, Star Wars, The X-Files, etc. Also has some nice non-sf fonts. The Java irritates me though...I guess I'm too impatient. Can't find it? FA has links to tons of PC Font sites. Links to things that'll make you font experience more enjoyable. Wonderful little program that will display your fonts.